Rewilding Europe has now released the second edition of its “Wildlife Watching Hides – a practical Guide 2.0”, the only available publication on the market for info about how to design and build professional wildlife watching tourism hides. “Wildlife Watching Hides – a practical Guide 2.0” dives into the details of the typical user groups and the different types of wildlife watching hides. It also offers a lot of planning and construction advice, and gives suggestions on ownership, maintenance and on if and how to do baiting, or not.There is also a dedicated section for case studies, where a variety of existing hides from all across the world have been analyzed in clear bullet-point style and color codes. An extremely useful special chapter presents technical drawings of a first proposed standard wildlife watching hide. The Rewilding Europe team members Staffan Widstrand, Neil Birnie and Matthew McLuckie are behind the text, and the technical drawings are made by Mattias Pedersen. The 78-page-booklet is an expanded update of the brochure which was released in December 2012. The 2.0 version has many more and new facts, more hide image examples from Europe and further best practices from across the world. It contains a set of technical drawings of a proposed standard cabin hide which makes the book very useful and practical for any nature entrepreneur who is planning to start up wildlife watching, using hides. More hide design technical drawings will follow in coming version of this Rewilding Europe product. Wildlife watching tourism is constantly increasing in Europe and for Rewilding Europe it is a business case that we give great priority to help develop, especially when based in hide solutions. Imaginative, well-designed and practically useful wildlife watching hides will help bring not only better wildlife experiences for the visitors and significant business for local entrepreneurs, but also possible finance for further rewilding actions and many new ways to engage a wide group of local stakeholders – in guiding, transfers, deliveries, construction, food and lodging. 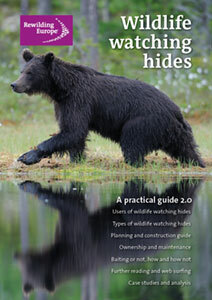 The Wildlife Watching Hides Guide 2.0 can be downloaded as pdf here, free of charge. See also the Annex with technical drawings.